Thanks to the work of non-profit organizations, the city can attract grants for important projects, believes I. Metshin. (KZN.RU, April 10). The Republic of Tatarstan occupies the 22nd position in terms of energy intensity GRP. Rustam Minnikhanov, the President of the RT, announced this today at the meeting of the Cabinet of Ministers of the RT. The meeting was held at the Kazan Expo site and was devoted to the implementation of the state program “Energy Saving and Energy Efficiency of the RT in 2018 and the tasks for 2019”. Anton Inyutsyn, the deputy minister of Energy of the RF, Rustam Nigmatullin, the first deputy prime minister of the RT, Leila Fazleeva, the deputy prime minister of the RT, Shamil Gafarov, the deputy prime minister and the head of the Staff of the Cabinet of Ministers of the RT, Albert Karimov, the deputy prime minister of the RT and the minister of Industry and Trade of the RT, Ilsur Metshin, the Mayor of Kazan, and others attended the event. 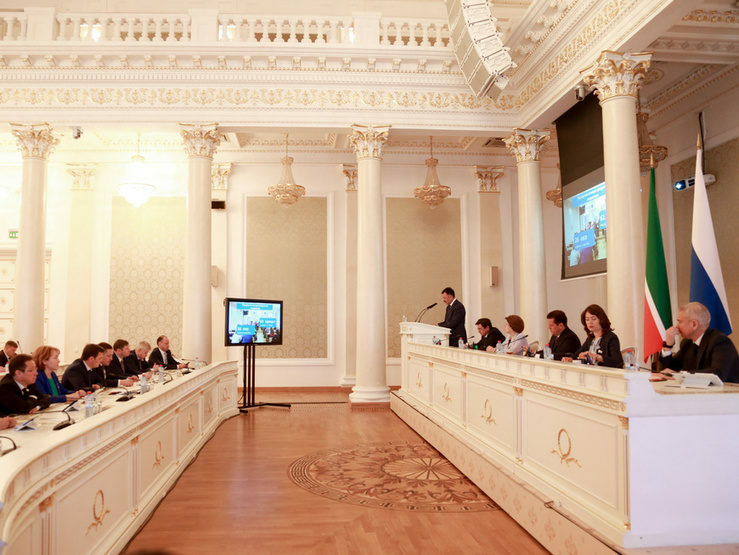 The meeting of the Cabinet of Ministers of the RT took place in the framework of the Tatarstan International Forum on Energy Efficiency “TEF – 2019”. The 20th International Specialized Exhibition “Energy. Resource Saving” and the 19th International Symposium “Energy Resource Efficiency. Energy Saving” are also taking place in the framework of the forum. During the meeting, Anton Inyutsyn raised issues of the development of a network of gas filling stations. In addition, the Deputy Minister of Energy of the RF proposed to change the name of the forum, adding the word “ecology”. According to him, when it comes to energy saving and energy efficiency, environmental issues are also affected. Rustam Minnikhanov, the President of the RT, commenting on this proposal, agreed that the environmental situation is very important in matters of energy saving. “I think we will change the wording”, he said. “It is necessary to systematize the tasks and how energy conservation affects the environment”. According to Rustam Minnikhanov, the specialized exhibition is a good platform for the exchange of opinions and experience by experts in energy. The exhibition presents many interesting solutions in energy efficiency, collected a lot of new technologies, a large number of partner companies who are interested in cooperation, said the President. Such large companies as Tatneft, Nizhnekamskneftekhim, Kazanorgsintez, KAMAZ, KPMO, Gorky Plant and many others actively work on energy and resource saving in the region, noted Rustam Minnikhanov. However, according to him, today the same purposeful work should be carried out not only in the real sector of the economy, but also in the socio-cultural sphere. So far, this area is seriously lagging behind the activities carried out by our large industrial companies, he said. “We are in the 22 position in terms of energy intensity of GRP, and we need to analyze this situation, what actions need to be taken to understand where there are reserves”, said Rustam Minnikhanov. Speaking about the work on the modernization of power facilities, Rustam Minnikhanov recalled that today there is a big task to modernize Zainsk GRES. “And we very much hope for the support of the federal government”, said the President. According to Rustam Minnikhanov, today all elements of energy saving should be implemented in such programs on the territory of the republic as a program for the overhaul of apartment buildings, for capital repairs of social and cultural facilities, as well as for new construction projects. “All modern energy efficiency technologies should be implemented as part of this work”, he said. Serious criticism was voiced during the meeting about the inefficient use of heat and electricity by state institutions. “We are on the 29 place in terms of electricity consumption for healthcare supply”, said Rustam Minnikhanov. “In terms of heat consumption in educational institutions, we rank 39, and in health care institutions – 35”. The President of Tatarstan proposed to develop a special program for the efficient use of heat and electricity in the public sector. “We need to prepare a 2-3-year program in the public sector so that we can carefully look at energy efficiency”, said Rustam Minnikhanov. “If we do not do anything, expenses will increase by 4 times. Within six months, such a program should be developed and adopted. Moreover, we saw at the exhibition that there are partner companies that are ready to support”. During the meeting, Rustam Minnikhanov noted a large project for the installation of individual heating points in Kazan. “This is a great job – 1300 IHP and the results of savings are 27%. It is necessary to fully implement this program in the republic until 2022”, he said. Speaking about the implementation of the program for the use of gas engine fuel, Rustam Minnikhanov marked: this is a very serious project. “We are actively working with the Ministry of Energy, and the results are good, but this is not what we want”, said the President. “We must multiply grow in terms of sales and compressed gas, and liquefied gas. The topic of gas engine fuel is relevant, taking into account our capabilities. We have all the necessary infrastructure, big investments have been made in gas stations”. According to Rustam Minnikhanov, today it is also necessary to adopt a program on the use of gas engine fuel for the agro-industrial sector, in terms of passenger traffic and urban transport, which is engaged in construction and housing and utilities, so that the whole system works. Rustam Minnikhanov also raised the issue of renewable energy sources. “The world is moving forward. The wind energy is especially relevant today. We have many opportunities there. Three sites were investigated in Tatarstan, and all three turned out to be suitable for use”, said Rustam Minnikhanov. At the end of the meeting of the Cabinet of Ministers of the RT, an agreement was signed on information exchange in the development of renewable energy sources between the Ministry of Industry and Trade of the RT and PAO “Enel Russia”, reports the press service of the President of the RT.